Tel Megiddo (Hebrew: מגידו; Arabic: مجیدو‎, Tell al-Mutesellim, lit. "Tell of the Governor") is the site of the ancient city of Megiddo whose remains form a tell (archaeological mound), situated in northern Israel(historic Palestine) near Kibbutz Megiddo, about 30 km south-east of Haifa. Megiddo is known for its historical, geographical, and theological importance, especially under its Greek name Armageddon. During the Bronze Age, Megiddo was an important Canaanite city-state and during the Iron Age, a royal city in the Kingdom of Israel. Megiddo drew much of its importance from its strategic location at the northern end of the Wadi Ara defile, which acts as a pass through the Carmel Ridge, and from its position overlooking the rich Jezreel Valley from the west. Excavations have unearthed 26 layers of ruins, indicating a long period of settlement. Some Christians believe that Armageddon will be the site of the final battle between Jesus Christ and the kings of the Earth who go to war against Israel, as outlined in the Book of Revelation. The site is now protected as Megiddo National Park and is a World Heritage Site. Megiddo was known in the Akkadian language used in Assyria as Magiddu, Magaddu; in Egyptian as Maketi, Makitu, and Makedo; in the Canaanite-influenced Akkadian used in the Amarna tablets, as Magidda and Makida; Greek: Μεγιδδώ/Μαγεδδών, Megiddó/Mageddón in the Septuagint; Latin: Mageddo. The Book of Revelation mentions an apocalyptic battle at Armageddon (Revelation 16:16), a Greek name of the site, derived from the Hebrew "Har Megiddo", meaning "Mount of Megiddo". "Armageddon" has become a byword for the end of the world. Megiddo was a site of great importance in the ancient world. It guarded the western branch of a narrow pass on the most important trade route of the ancient Fertile Crescent, linking Egypt with Mesopotamia and Asia Minor and known today as Via Maris. Because of its strategic location, Megiddo was the site of several historical battles. The site was inhabited from approximately 7000 BCE to 586 BCE though the first significant remains date to the Chalcolithic period (4500–3500 BCE). The town experienced a decline in the Early Bronze Age IV period (2300–2000 BCE), but was somewhat revived around 2000 BCE. Following massive construction, the town reached its largest size in the Middle Bronze Age, at 10–12 hectares. Though the city was subjugated by Thutmose III (r. 1479–1425 BCE), it still prospered, and a massive and incredibly elaborate palace was constructed in the Late Bronze Age. The city was destroyed around 1150 BCE, and the area was resettled by what some scholars have identified as early Israelites, before being replaced with an unwalled Philistine town. When the Israelites captured it,[dubious – discuss] though, it became an important city, before being destroyed, possibly by Aramaean raiders, and rebuilt, this time as an administrative center for Tiglath-Pileser III's occupation of Samaria. [dubious – discuss] However, its importance soon dwindled, and it was finally abandoned around 586 BCE. Since that time it has remained uninhabited, preserving ruins pre-dating 586 BCE without settlements ever disturbing them. Instead, the town of al-Lajjun (not to be confused with the al-Lajjun archaeological site in Jordan) was built up near to the site, but without inhabiting or disturbing its remains. 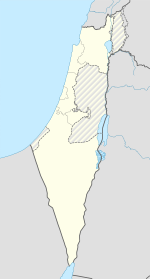 Kibbutz Megiddo is nearby, less than 1 kilometre (0.62 mi) to the south. Today, Megiddo Junction is on the main road connecting the center of Israel with lower Galilee and the north. It lies at the northern entrance to Wadi Ara, an important mountain pass connecting the Jezreel Valley with Israel's coastal plain. Megiddo has been excavated three times and is currently being excavated yet again. The first excavations were carried out between 1903 and 1905 by Gottlieb Schumacher for the German Society for the Study of Palestine. Techniques used were rudimentary by later standards and Schumacher's field notes and records were destroyed in World War I before being published. After the war, Carl Watzinger published the remaining available data from the dig. Megiddo has most recently (since 1994) been the subject of biannual excavation campaigns conducted by the Megiddo Expedition of Tel Aviv University, currently co-directed by Israel Finkelstein and David Ussishkin, with Eric H. Cline of The George Washington University serving as Associate Director (USA), together with a consortium of international universities. One notable feature of the dig is close on-site co-operation between archaeologists and specialist scientists, with detailed chemical analysis being performed at the dig itself using a field infrared spectrometer. In 2010, the Jezreel Valley Regional Project, directed by Matthew J. Adams of Bucknell University in cooperation with the Megiddo Expedition, undertook excavations of the eastern extension of the Early Bronze Age town of Megiddo, at the site known as Tel Megiddo (East). A path leads up through a Solomonic gateway overlooking the excavations of the Oriental Institute. A solid circular stone structure has been interpreted as an altar or a high place from the Canaanite period. Further on is a grain pit from the Israelite period for storing provisions in case of siege; the stables, originally thought to date from the time of Solomon but now dated a century and a half later to the time of Ahab; and a water system consisting of a square shaft 35 metres (115 ft) deep, the bottom of which opens into a tunnel bored through rock for 100 metres (330 ft) to a pool of water. Megiddo's 5,000 year old "Great Temple", dated to the Early Bronze Age I (3500–3100 BCE), has been described by its excavators as "the most monumental single edifice so far uncovered in the EB I Levant and ranks among the largest structures of its time in the Near East." The structure includes an immense, 47.5 by 22 meters sanctuary. The temple is more than ten times larger than the typical temple of that era. The first wall was constructed in the Early Bronze Age II or III period. It was determined that the temple was the site of ritual animal sacrifice. Corridors were used as favissae (deposits of cultic artifacts) to store bones after ritual sacrifice. More than 80% of the animal remains were of young sheep and goats; the rest were cattle. In 2010, a collection of jewelry pieces was found in a ceramic jug  The jewelry dates to around 1100 BCE The collection includes beads made of carnelian stone, a ring and earrings. The jug was subjected to molecular analysis to determine the contents. The collection was probably owned by a wealthy Canaanite family, likely belonging to the ruling elite. The Megiddo ivories are thin carvings in ivory found at Tel Megiddo, the majority excavated by Gordon Loud. The ivories are on display at the Oriental Institute of Chicago and the Rockefeller Museum in Jerusalem. They were found in the stratum VIIA, or Late Bronze Age layer of the site. Carved from hippopotamus incisors from the Nile, they show Egyptian stylistic influence. An ivory pen case was found inscribed with the cartouche of Ramses III. At Megiddo two stable complexes were excavated from Stratum IVA, one in the north and one in the south. The southern complex contained five structures built around a lime paved courtyard. The buildings themselves were divided into three sections. Two long stone paved aisles were built adjacent to a main corridor paved with lime. The buildings were about twenty-one meters long by eleven meters wide. Separating the main corridor from outside aisles was a series of stone pillars. Holes were bored into many of these pillars so that horses could be tied to them. Also, the remains of stone mangers were found in the buildings. These mangers were placed between the pillars to feed the horses. It is suggested that each side could hold fifteen horses, giving each building an overall capacity of thirty horses. The buildings on the northern side of the city were similar in their construction. However, there was no central courtyard. The capacity of the northern buildings was about three hundred horses altogether. Both complexes could hold from 450–480 horses combined. The buildings were found during excavations between 1927 and 1934. The head excavator originally interpreted the buildings as stables. Since then his conclusions have been challenged by James Pritchard, Dr Adrian Curtis of Manchester University Ze'ev Herzog, and Yohanan Aharoni, who suggest they were storehouses, marketplaces or barracks. 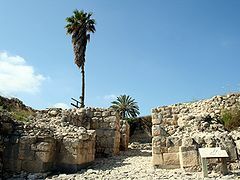 The Megiddo church is not on the tell of Megiddo, but nearby next to Megiddo Junction inside the precinct of the Megiddo Prison. It was built within the ancient city of Legio and is believed to date to the 3rd century, which would make it one of the oldest churches in the world. ^ Wiener, Noah." Early Bronze Age: Megiddo's Great Temple and the Birth of Urban Culture in the Levant" Bible History Daily, Biblical Archaeology Society, 2014. ^ Bahn, Paul. Lost Cities: 50 Discoveries in World Archaeology. London: Barnes & Noble, Inc., 1997. 88–91. Print. ^ Davies, Graham, Megiddo, (Lutterworth press, 1986), pg 1. ^ Schumacher, Gottlieb; Watzinger, Carl, 1877-1948, (1929): Tell el Mutesellim; Bericht über die 1903 bis 1905 mit Unterstützung SR. Majestät des deutschen Kaisers und der Deutschen Orientgesellschaft vom deutschen Verein zur Erforschung Palästinas Veranstalteten Ausgrabungen, vol. 2. ^ Gordon Loud (1948). "Plates" (PDF). oi.uchigao.edu. Megiddo 2. Seasons of 1935-1939, Oriental Institute Publication 62, Oriental Institute of Chicago. ISBN 0-226-49385-7. ^ "Early Bronze Age: Megiddo's Great Temple and the Birth of Urban Culture in the Levant - Biblical Archaeology Society". 9 October 2016. Retrieved 7 January 2017. ^ Wiener, Noah. "Early Bronze Age: Megiddo's Great Temple and the Birth of Urban Culture in the Levant" Bible History Daily, Biblical Archaeology Society, 2014. ^ "Gold Egyptian Earring Found in Israel". Retrieved 7 January 2017. ^ Hasson, Nir. "Megiddo Dig Unearths Cache of Buried Canaanite Treasure". Retrieved 7 January 2017 – via Haaretz. ^ Amihai Mazar, Archaeology of the Land of the Bible (New York: Doubleday, 1992), 476–78. Wikimedia Commons has media related to Tel Megiddo.